Rabbi Stav of the Tzohar organization tells Arutz Sheva about weighty religious bills and thirst for Jewish identity in Israel. 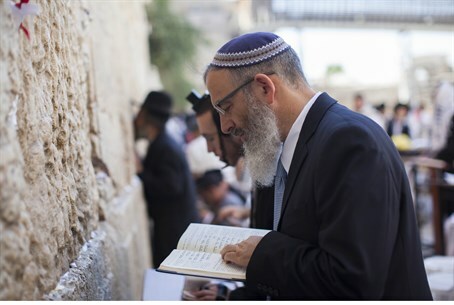 Arutz Sheva spoke with Rabbi David Stav, a prominent religious-Zionist rabbi and head of the Tzohar rabbinic institute, ahead of the Jewish New Year (Rosh Hashanah), about how the Jewish state has developed in the past year. According to the rabbi, last year was a "unique" one in terms of religion and state thanks in part to a bill that his Tzohar organization passed in the Knesst, which "enables a couple to get registered (for marriage) wherever they want to." The bill "contributes to competition between local rabbinates" and attracts more Jews to religious weddings, according to Rabbi Stav. Some notable rabbis disagreed, explaining that rabbis far from the couple's hometown might not be able to thoroughly check information to confirm their eligibility to wed according to Jewish law. Rabbi Stav added that his organization is working on another bill to make a similar change for the process of Jewish conversion, letting each rabbi establish a rabbinic court for conversion in the city. He noted that this goal has yet to be accomplished. That bill also has been questioned, with Chief Ashkenazi Rabbi David Lau warning earlier in the month that he had been told by rabbis in the UK that world rabbis will not be able to accept Israeli converts if the bill is passed, due to concerns that the Chief Rabbinate will not be able to confirm the uniform validity of conversions. Aside from the various bills, Rabbi Stav spoke about the changes in Israel wrought in the course of the last year, in which Operation Protective Edge revealed an almost unprecedented level of unity among the Jewish people. "We saw how deep is the thirst for Jewish identity, how deep is the connection between the general Israeli society to G-d, to religious rituals," said the rabbi. However, he noted that "on the other hand more and more Israelis unfortunately feel themselves to be far away from Judaism." According to the rabbi, the answer is to "expose them to Judaism that doesn't impose on them anything but suggests to them something they are not aware of." Alongside a shocking rise in global anti-Semitism, Rabbi Stav said Jews in the diaspora increasingly have been seen as caring less about Israel, at least publicly, and feeling that they could survive without the Jewish state. "But that's not the truth," remarked the rabbi, arguing the physical and spiritual future of these Jews' children depends on Israel.